Local entrepreneurs are a scrappy bunch. Abandoned objects from bowling alley floors to corrugated metal are popping up in commercial décor. A found flame-retardant suit greets visitors to Birmingham’s new Complex Boutique, where former Detroit Public School lab tables serve as display surfaces. At Supino Pizzeria in Detroit’s Eastern Market, wooden doors and panels line the walls. Many of the salvaged building elements and fixtures are saved from the wrecking ball. At the Midtown space for Avalon Bakery, reclaimed doors, lights, and other fixtures rescued from the abandoned downtown YWCA helped convert a “windowless urban cave” into what co-owner Jackie Victor describes as a “cozy, village-like community space. Victor says the sustainable-building idea came from Marisa Gaggino, owner of Heritage Co. II in Royal Oak, but it fit well with the company’s business model of sustainability and community. “The space has that authenticity people crave with links to our Detroit heritage, and we didn’t use virgin materials to do it,” she says. Gaggino says “the industrial look is hot in design right now.” The best place to find these goods? 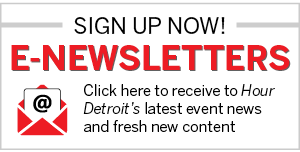 Detroit tool-and-die shops, factories, foundries, and auto-assembly facilities. 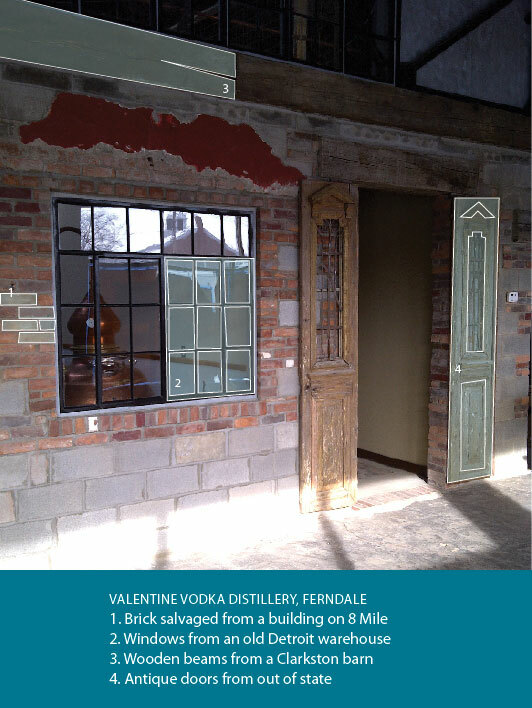 Leaded warehouse windows from a Detroit factory admit light at the newly opened Valentine Vodka distillery and tasting room in Ferndale. Wooden beams from a Clarkston barn and bricks swapped for a bottle of vodka at a home demolition on Eight Mile Road add to the intended vibe — a Prohibition-era tasting room fit for Al Capone, says owner Rifino Valentine. Using salvaged rather than new materials reflects his commitment to the sort of quality and authenticity that go into his homemade sour mix, small-batch infused vodkas, and infused vodkas made with Eastern Market produce. Whether chosen for aesthetics, cost, sustainability, or history, Detroit discards are getting a second life. Given what they say about one man’s trash, you could say Detroit has proved to be a treasure.